a memorial window by Leonard Evetts at the west end of the south aisle. The three chancel windows were completed by 1912 by James Eadie-Reid. They are technically very interesting, revealing an experimental attitude to the craft of stained glass. They depict the Feeding of the Five Thousand, the Changing of Water into Wine by Christ at the Wedding at Cana in Galilee, and the Transfiguration of Christ. 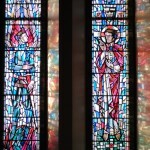 The War Memorial Windows at the west end were unveiled and dedicated by the Revd Ralph Moorsom, on Sunday September 19th 1948. 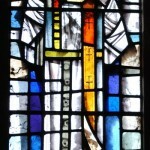 The window on the left shows St Michael sheathing his sword having overcome evil. St Michael in the Book of Revelation is the leader of the Angelic host. 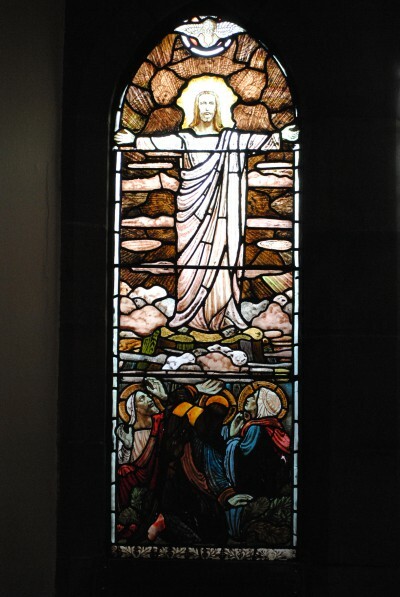 In the right window the ascended Christ blesses this victory. At the feet of Christ are Flanders poppies which have become to us emblems of man’s toil and suffering in war. This window also shows the “crown” emblem of All Saints, and the St Cuthbert’s Cross of Durham. These were amongst the early work of Leonard Evetts. 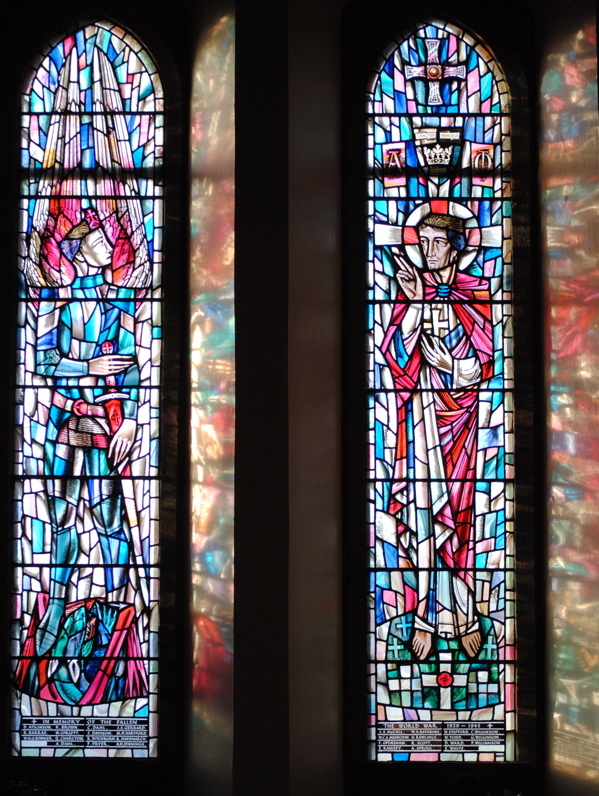 This colourful window can be found on the west wall of the church, just inside the main entrance. 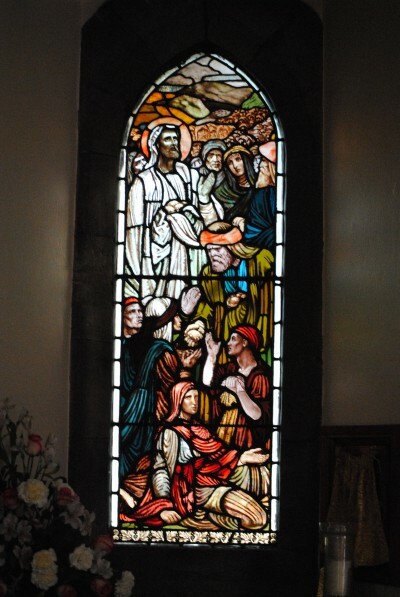 The window was designed and created by Leonard Evetts. This work is amongst his latter pieces. It is a memorial to Sir Robin Chapman, Bart. 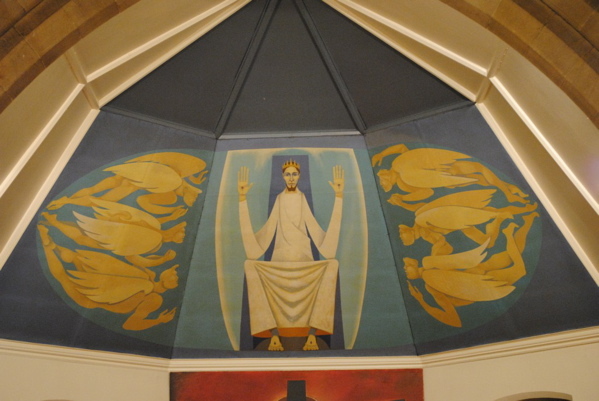 The work, which dominates the chancel, is entitled the Transformation Scene. 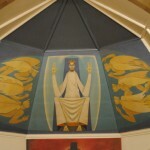 Preliminary sketches for the murals were exhibited at All Hallows on the Wall, a Christian arts centre in London, and attracted wide interest. 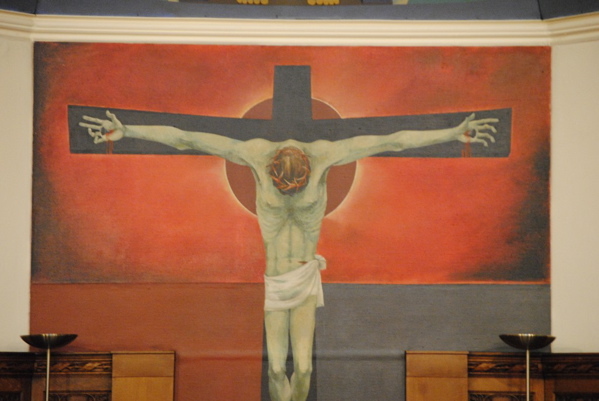 Designed and painted on to panels in 1966 by Michael Hoare, the murals depict the crucified and enthroned Christ flanked by angels. The spandrel paintings on the south side of the Nave are by James Eadie-Reid (1856-1928) who both painted and worked with stained-glass windows. They are particularly fine paintings, capturing the dramatic moment. 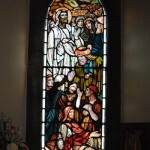 They depict Jesus’ agony in the garden of Gethsemane, the resurrection on the first Easter Day and an angel appearing to Mary at the empty tomb. 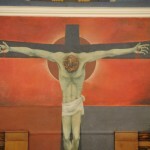 In the south aisle hang three framed paintings by James Eadie-Reid depicting the same subjects which were used to provide the PCC with an indication of the finished pieces. James Eadie-Reid was born in Dundee in 1856. He studied at Edinburgh, working with Patrick Geddes and Robert Ashbee. He was a painter of figurative works and landscapes, specialising in oils and watercolours. He exhibited at the Royal Scottish Academy and the London Salon. 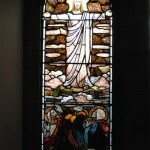 Eadie-Reid designed stained glass windows and murals for many churches in the north east and further afield. His works were designed to communicate the Christian gospel. 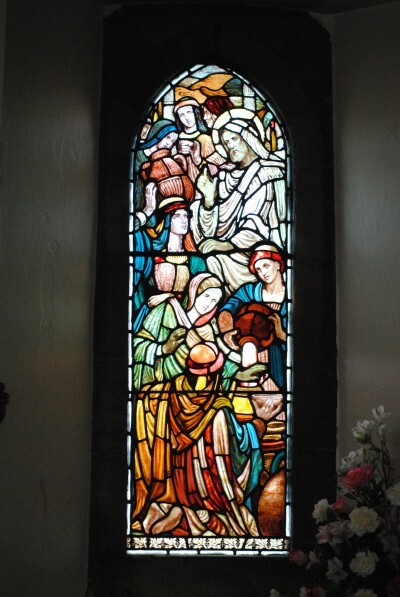 Leonard Evetts was a leading craftsman in stained glass, designing windows throughout the country. 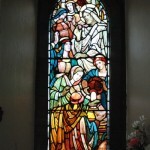 He created the War Memorial Windows and The Good Shepherd Window at the west end of All Saints Church. Evetts used medieval recipes for colouring which, together with varying thickness of glass, gave each piece a jewelled appearance. Painter, muralist, illustrator and teacher, Michael Hoare qualified in fine arts at Croydon College of Art in 1950. He worked in theatre design at the Old Vic Theatre School, Covent Garden, Glyndbourne and Stratford Old Vic. “The gold crown refers to sanctity, the gold scrolls with red inscription Sanctus allude to the chant of the redeemed, “Holy, Holy, Holy.” The silver left half of the field indicates the brightness of the heavenly life in contrast to the black right half and the trials of the earthly life.” This can be seen used above the ascended Christ by Leonard Evetts in his window design.